Biobased Carbon Content provides a way of testing a product to determine the percentage of carbon from “natural” (plants etc) sources versus “synthetic” (petrochemical or coal, ie fossil-based) sources. For reference, 100 % Biobased Carbon Content indicates that a material is entirely sourced from natural sources. 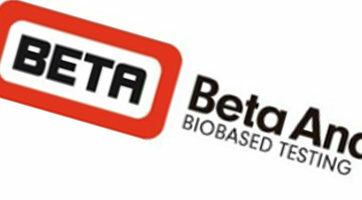 Beta Analytic Inc was involved in the development of the first standards developed in this field of testing and offer testing and certification services. The result is obtained using the radiocarbon isotope (also known as Carbon-14, C14 or 14C), a naturally occurring isotope of carbon that is radioactive and decays in such a way that there is none left after about 45,000 years following the death of a plant or animal. Its most common use is radiocarbon dating by archaeologists. An industrial application was also developed to determine if consumer products and CO2 emissions were sourced from plants/biomass or from materials such as petroleum or coal (fossil-based). Interpretation and application of the results is straightforward. A value of 100% biobased or biogenic carbon would indicate that 100% of the carbon came from biomass living in the natural environment and a value of 0% would mean that all of the carbon was derived from petrochemicals, coal and other fossil sources. A value between 0-100% would indicate a mixture. The higher the value, the greater the proportion of naturally sourced components in the material.